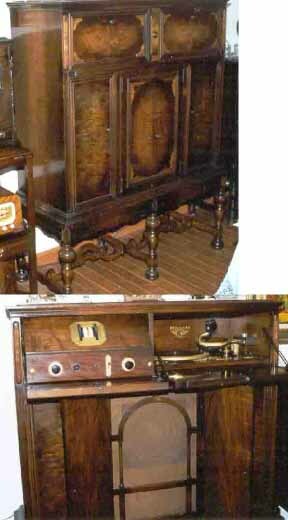 On this page you will find pictures of many types of antique radios. The group of 5 photos above were from the international group that came to the Shaker Road firehouse. There was many different radios to be seen which all of them were some of the nicest looking radios and working radios that I have ever seen. I have added four more photos of this meet. There were radios from the 40's,50's,60's,70's,80's,90's, and ones from this centery too. Tube and as you can see transistor radios also. The four new photos I'll start with the fancy nice gift tshirt given to the German fellow that was with the international group. He loved as you can see in the photo. 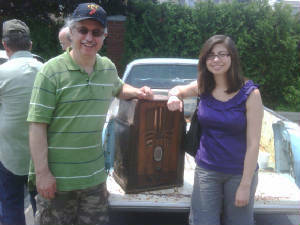 He aslo is the owner of the RCA brown bakelite table radio which was worked on by Lou. 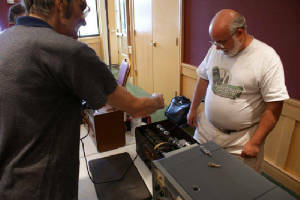 Then in one of the other photos is Lou and I checking out a Atwater Kent metal ac set that looked like it had come right out of a Atwater Kent radio store! Never had been tested by its owner. So after a quick check by Lou and I had a set of headphones and a short wire antenna attached we tested it. It worked like it was brandnew! 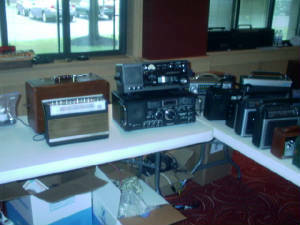 Now the last new photo was working on more of the radios that were there with the Atwater Kent. I'm happy to say along with the radios owner everyone that was gone over all worked very well. The main work that was done was tubes tested, replaced if needed, and som noisy controls cleaned. 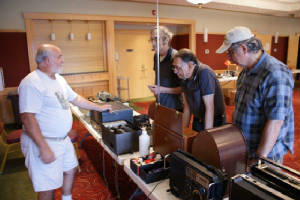 All minor issues and as a result all the radios worked very well and one very happy owner of the radios! 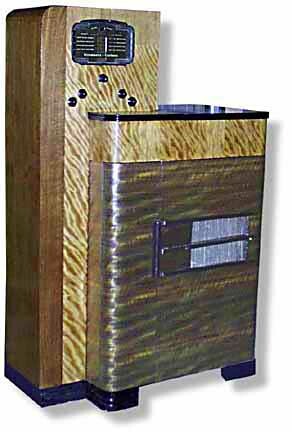 Here is a custom cabinet with a Sromberg-Carlson radio inside. 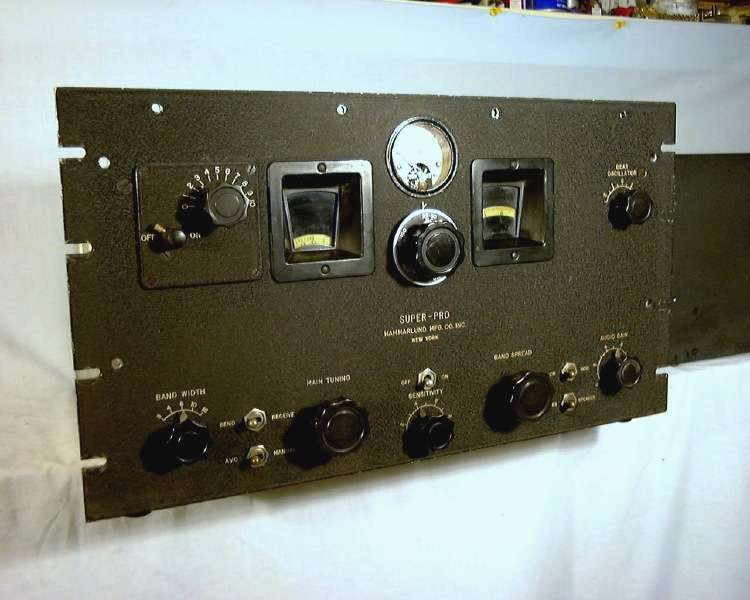 The chassis is a multi band receiver with standard broadcast and shortwave bands. 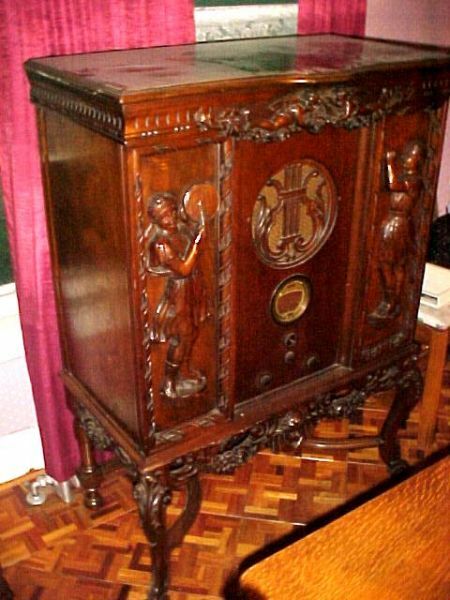 Note all the fancy engravings on this cabinet from top to bottom and on the front sides too. 1938 Stromberg Carlson Skyscraper console. This very stylish set is very rare. Radiola 10660 floor speaker with a radiola chassis put into it. 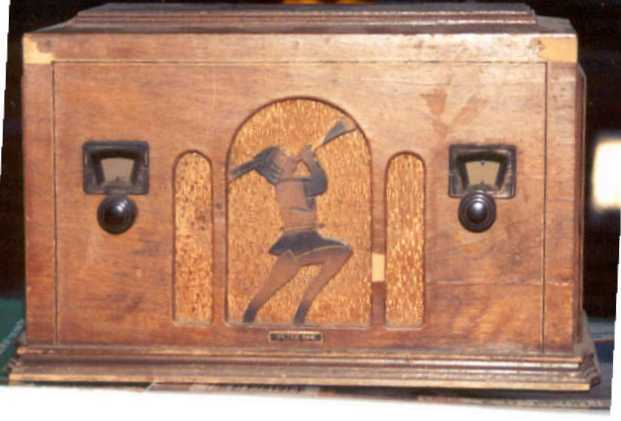 Nice 1920's custom radio. 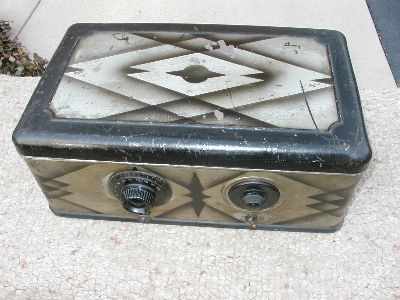 Here is a RCA from the mid 1920's. This model is known as the Hyperion. This was complete home entertainment 1920's style! Peter Pan wood table set from the mid 1930's. Peter Pan sets are easy to id from the figirines in the grill cloth. Here is a novelty radio from the 1930's. 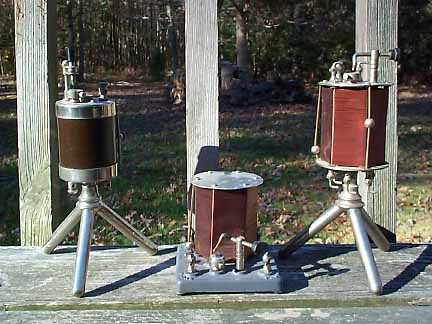 This all brass radio lamp has the chassis in the base. The controls are up front and the tubes are behind the heart shaped openings on the side. The speaker is housed under the lamp socket. This was a idea that was tried by manufactures from the 1920's through the 1950's. 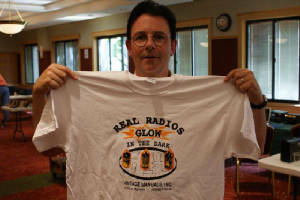 Here is one for you ham radio buffs. A 1937 Hammarlund Super Pro model 110. This is a general coverage receiver. This one is a rack mounted unit. You could buy it with a cabinet also. The power supply is seperate and can be seen to the right of the radio. 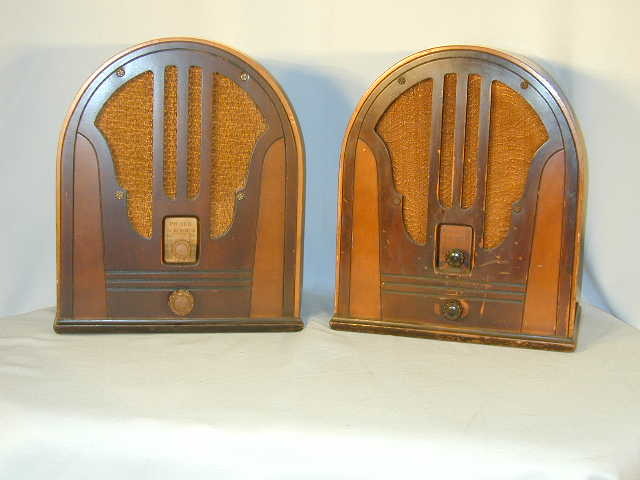 Here is a pair of Philco cathedrals. 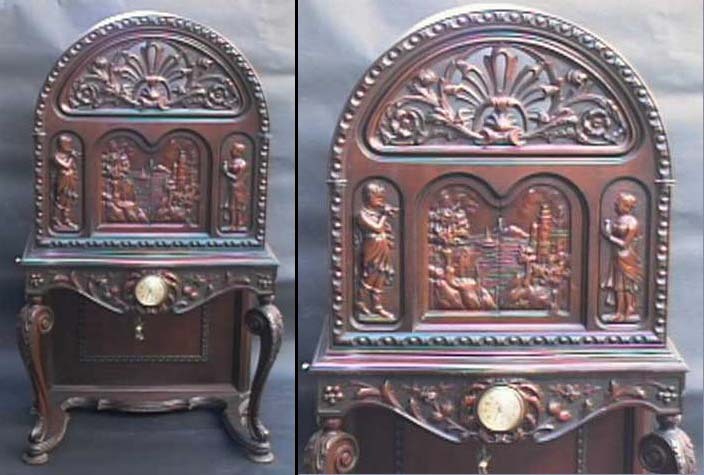 That name was given to this style of radio because of the cabinets church shape design. Philco sold many of this type of radios all through the 1930's. The one on the right is a model 84 jr. The one on the left is unknown. 1921 Grebe CR9 receiver. A H Grebe was an early radio pioneer. He started his company in 1909 and sold parts for wireless operators. He kept up with the changing technology as the 20th century progressed. After WWI he was selling equipment to the hams and had good radios in place as the broadcast radio boom took off in the early 1920's. Grebe used the Armstrong regenitive circuit and the trf circuit in his radios. 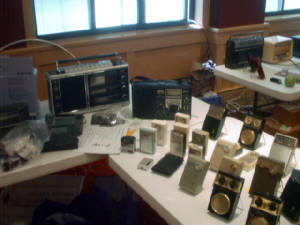 He sold radios that would receive shortwave(first to sell 10 meter radios), standard broadcast, longwave and the maritime bands. He sold other radio devices in the 1920's that included wave traps and a device that would cut down regeneration interference. 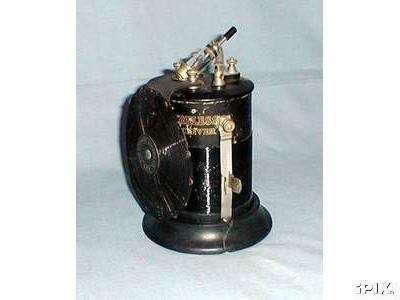 Even in the begining of the 1920's Grebe manufactured all the parts that went into his radios. By the end of the 1920's Grebe closed down his factory due to the heavy competion and poor sales of his ac sets. Three different crystal sets. Maker is unknown on all three. 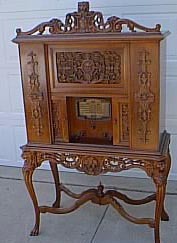 Here is another example of a custom cabinet radio from the 1930's. The dail looks like a Philco dial from one of the 1937 models? Actual radio chassis maker is unknown on this one. 1920's glass case hombrew. Many homebrew builders in the 1920's made sets with glass cases to show off thier sets. This set belongs to Ron Lawrence AWA member. He just got the last Gold Airline globe 201A tube for this set. Those tubes are a nice touch to help show off this set! 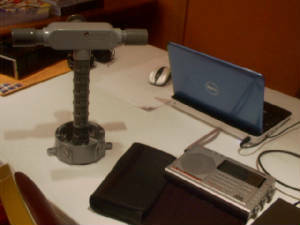 Pictured above is a wireless receiver. This appears to be a home made set. 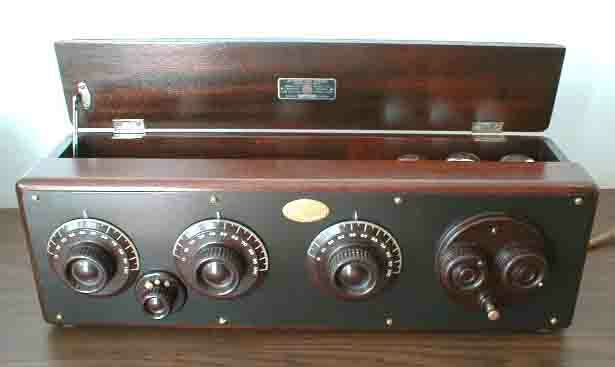 On the front of the radio are two DeForest tubular style audion tubes. Theese tubes were made around the WWI era. DeForest audions are highly collectable. Imagine listening to cw or early voice transmisions on this set! One of our club members with his duaghter which she came with him to see what we were about. She had a good time too. 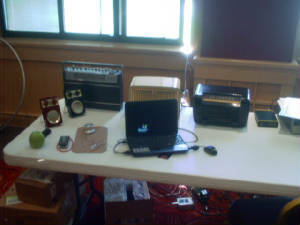 The radio shown is a Philco model 116B tombstone which has shadow tuning,11 tubes, and was for sale. It didn't sell that day but I bought it later the following week. Pictured above is a Tower ship cone speaker from the mid 1920's. Cone speakers replaced horns as radio speakers. This is a very nice example of one. This one is 18" in diameter. Some models were up to 36" in diameter and were hung on the wall. 1937 Philco 37-10 console. Very stylish floor console with multi band coverage. Note the dial area. 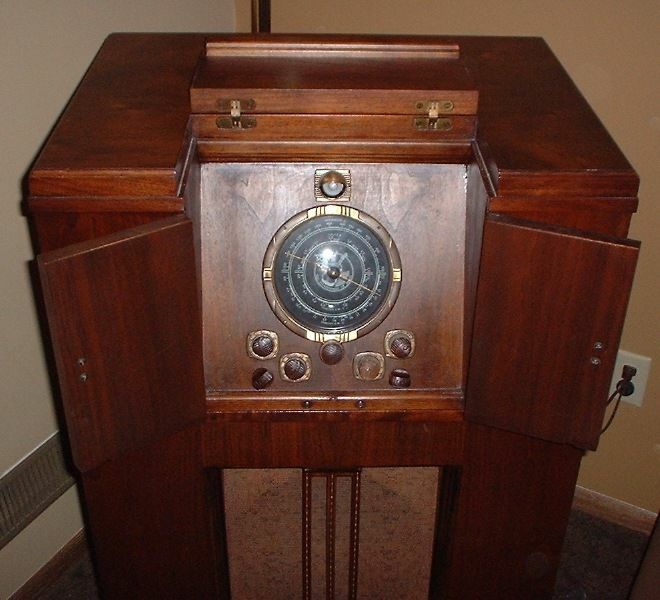 Philco offered a rotating preselected tuning system that you rotated around the dial and would stop on the stations that you selected when this system was set up. This was offered on some consoles and table models. 1924 Bronie crystal set made in England. 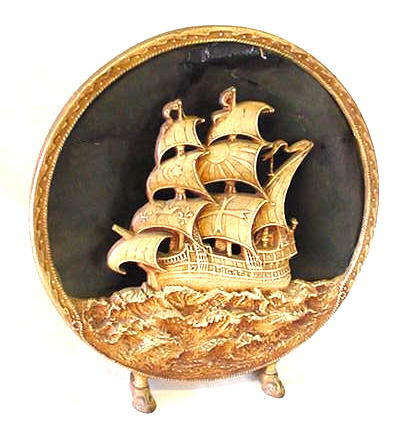 The set is made of bakelite. Notice the tuning coil is on the side of the set as a seperate section. Most crystal sets had the coil wound around the circular section. 1947 Scott 600b console. 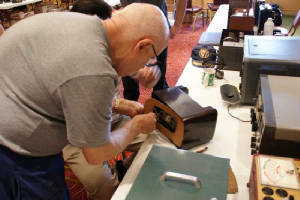 Scott still made fancy radios after WWII. The dials were changed to a verticle design. The chrome chassis was still used. Custom cabinets still could be ordered. This one is in a Chipendale cabinet. This is the last radio Scott was personaly involved with its design. He lost control of the company and left. Here is the first fancy radio in the fancy radio photo section. E H Scott in the very start when he made radios starting with batterysets in the 1920s made high quality radios. His radios were always on the technical edge even right in the begining. 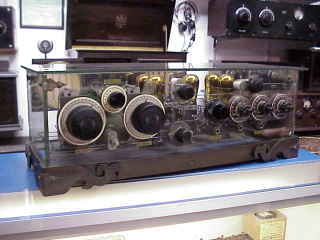 Through the 1930s as tube technology changed Scott made his radios useing the latest tubes having 15 tube chassis like the All Wave 15 console shown above. 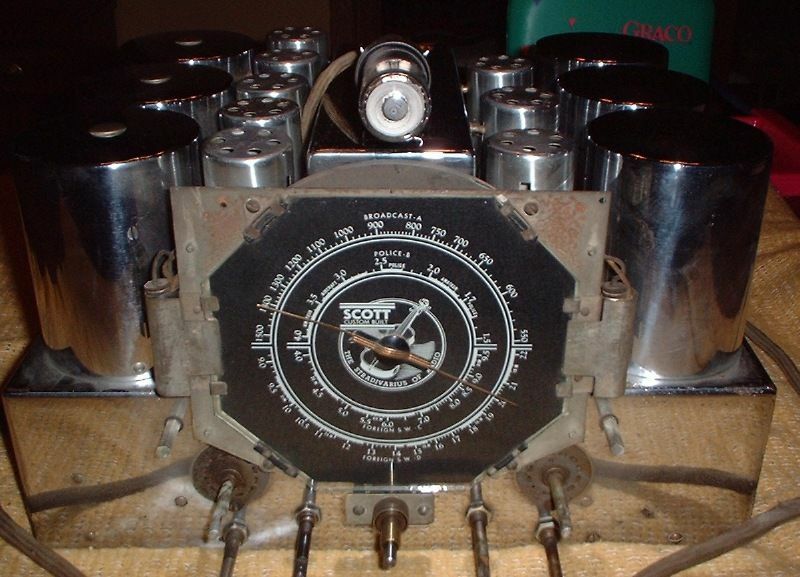 Scott also was useing chrome plated chassis with a seperate audio power supply chassis that were chromed also. The All Wave 15 consoles were availible with Scott in house cabinets, without cabinets, or ouside manufactured custom cabinets could be ordered. 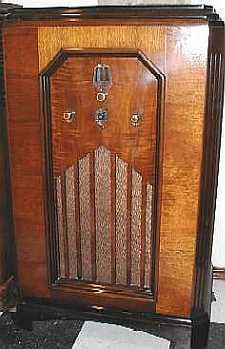 As the 1930s decade went on Scott radios would get even fancier in thier design with more tubed chassis and added features. Even the larger producing radio companies had some fancy sets includeing RCA. 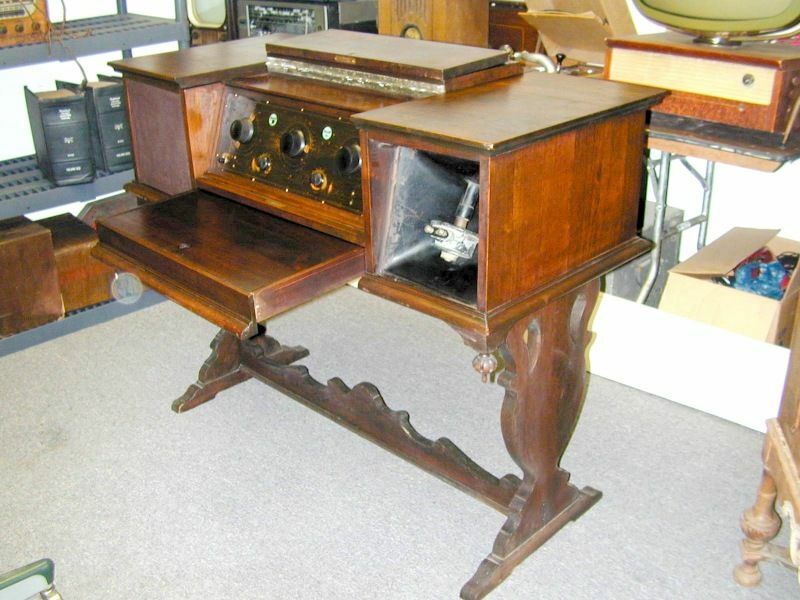 1934 RCA had a very fancy console with AM Shortwave and phomograph. In the photo above is shown RCA's top of the line set the model381 All Wave Duo with a 12 tube chassis. The radio has coverage range from 140kc through 40 megacycles though five bands. This radio had seperate tone controls for Treble and bass. Audio output was through a pair of 42 tubes giving the radio plenty of audi power. 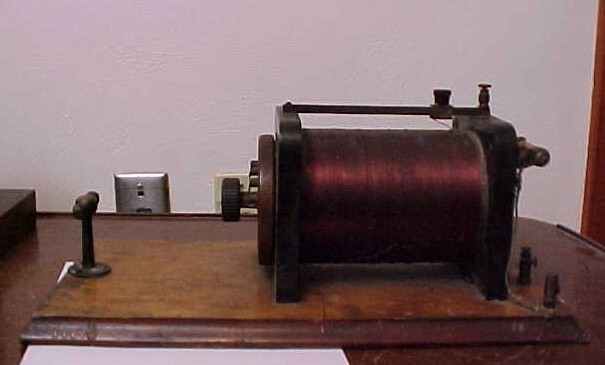 Now the phonograph on this radio used a magnetic pickup. But here is the thing that is different on the phonograph. It was 2 speed having the 78 rpm speed which was standard at the time. 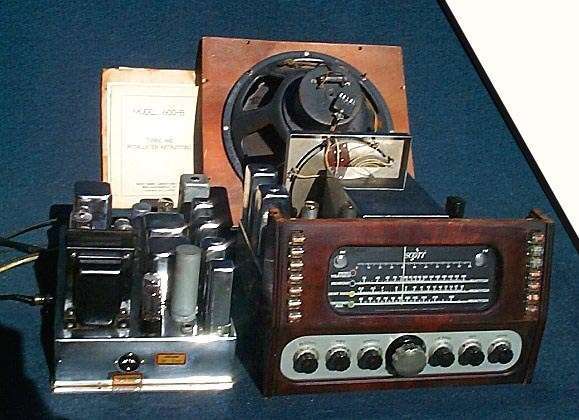 But it also had the 33 1/3 speed which RCA used to record transcripts (radio shows specail events etc) which you could order from RCA and play them! 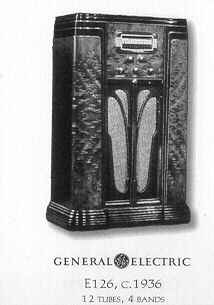 General Electric was another mass producer of radios. In 1938 they manufactured this push button wonder. The model G-106 BC SW console. It was thier top of the line console for 1938. It has a 10 tube chassis with a pair of 6V6 tubes for audio output. Now with this 96 push button wonder watching it in operation you would have thought you were in the future! The reason was it also had a built in clock timer which to start with the radio could turn on at a set time then the radio would go to one of the 6 preset stations then stay on that station. Go on to another preselected station etc and then when the preset time length was over the radio would turn itself off. 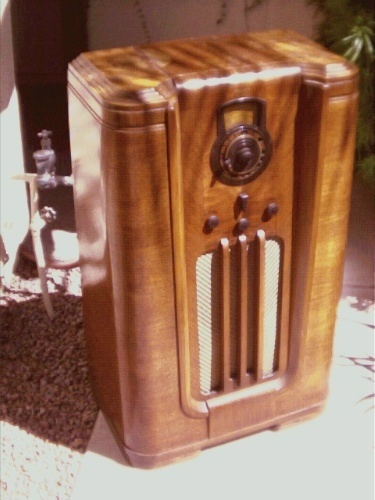 1932 Scott custom radio cabinet. 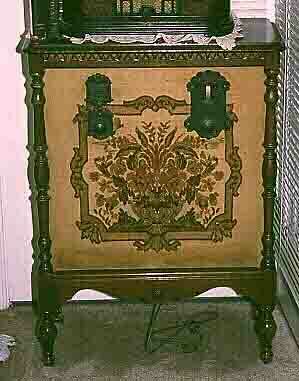 Notice all the fancy scroll work and engraving in this cabinet. There is a clock housed in the bottom of this cabinet also. 1936 General Electric E126 console. 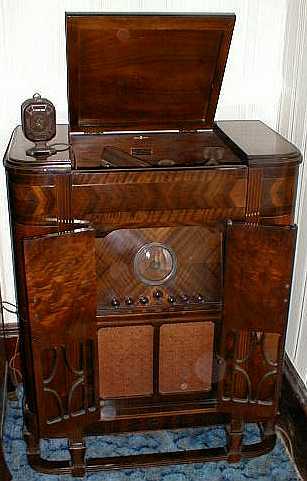 1936 General Electric was manufacturig it's own radios again. From 1933-1935 GE had it's sets made by RCA due to the court rulings on the radio patents pool held by RCA,GE and Westinghouse. This set receives from 535kcs-70,000kcs. This radio has one unusual feature not found on am radios and home receivers. AFC (automatic frequancy control) was employed on this set. AFC would be used on many ameteur receivers and fm radios in the comming years. This set was quite the performer. 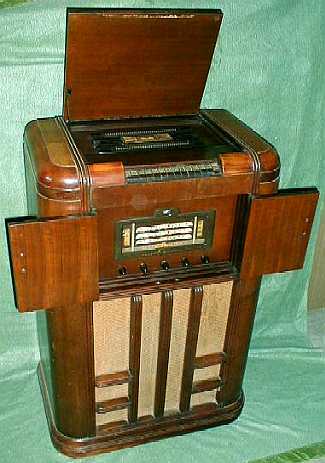 This design was so good that RCA used it in many of its own ameteur sets in the mid to late 1930s. I have one now in my collection and the restoration is under way. Atwater Kent model 20 trf table set. This is the big box version. Atwater Kent was one of the largest makers of radios in the 1920's. Something a little different as for an Atwater Kent radio! Instead of the green,black,or brown finish on the metal cabinets a jazzy designed pait job was given to theese dealer promotion radios. Quite a standout over the regular painted radios. Here is a 1938 Scott model Super XII in a Northernair cabinet. The chassis is pictured below. 1925 Ozarka Senior console model S1. 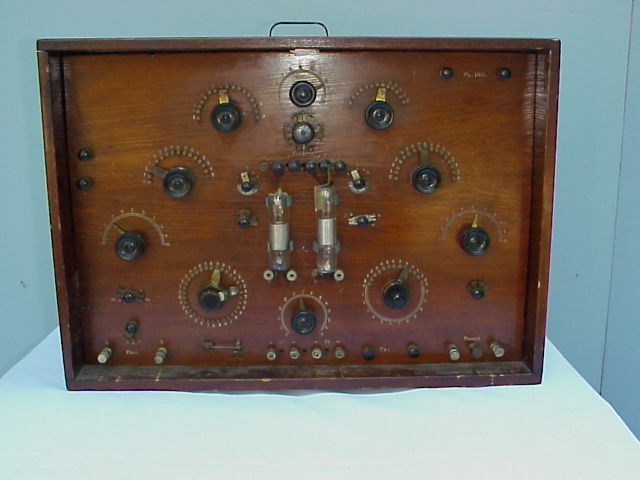 This Ozarka console housed a 5 tube three dial trf set. The left side compartment housed the batteries or battery elimanaters. The right sidecompartment shown is the built in speaker. This speaker was made by the Miller company and the horn was made out of hard rubber. Rubber was inexpensive and could be molded to many shapes. 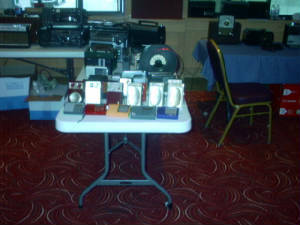 Ozarka was a well known popular brand that built good quallity radios through 1932. Ozarka was one of the first manufacture where all salesman, and service personal were factory trained.